Gamucci Micro Deluxe has been awarded TWO AND ONE HALF STARS. It is NOT RECOMMENDED. According to their website, UK-based Gamucci introduced the e-cigarette to Europe in 2007. The Huffington Post UK referred to Gamucci as one of “the more recognized brands” in a 2012 article describing the rising popularity of e-cigarettes. This did not go unnoticed at eCigs HQ, so we headed over to the Gamucci site to place our order for a starter kit. Gamucci presently offers two starter kits to choose from: the Gamucci Micro Deluxe and the Gamucci Micro USB. The Micro Deluxe Starter Kit includes two “hi-power” rechargeable, 2.75, “375-puff,” 240mAh lithium ion batteries; a three-pack of “high-density,” “375-puff” original flavor cartomizers; an additional “free” cartomizer; one USB charger; one AC adaptor, a black velvet carrying pouch; and user manual. While we would have far preferred five cartomizers (something of a standard with many kits), the Gamucci Micro Deluxe is currently priced at only $49.95. You would be hard-pressed to find many 2-battery kits that offer as much for fifty dollars. However, when comparison shopping e-cigarettes it is important to keep in mind that unlike many other brands, Gamucci does not offer free shipping or a money-back guarantee. 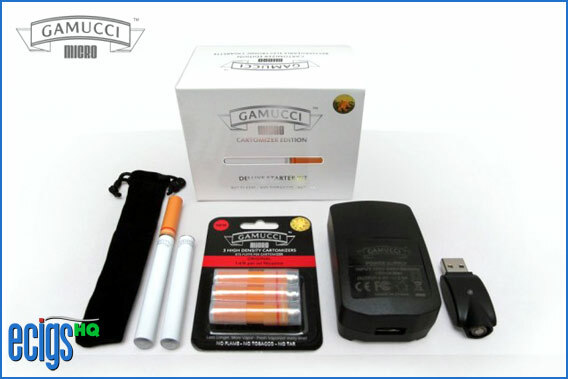 The Gamucci Micro USB is a three-piece “bare-necessities” kit, consisting of one “hi-power” rechargeable, 2.75, “375-puff,” 240mAh lithium ion battery; a single “high-density,” “375-puff” cartomizer; one USB charger; and user manual. The kit is currently priced at $21.95 which is a very reasonable price as the battery alone is worth that much. The Micro Deluxe Kit arrived in less than a week and we were excited to put it through its paces. Unfortunately our excitement was to be short-lived. We opened the distinct, squarish box. Everything seemed to be in good order. We glanced through the user manual, and then screwed a cartomizer to one of the two high-powered batteries. We put the Gamucci Micro Deluxe to our lips and inhaled. The good news was that the battery had arrived charged. The bad news is the pretty much everything else. The taste was sharp and “musty,” and the flavor reminded us of the Nicotek Metro, Luci, and Smoke Fifty-One. This was not a complimentary association as all three are amongst our lowest-ranked brands for flavor. The vapor volume was equally unimpressive and could be considered slightly below average at best. Drawing was more difficult than it should have been for the modest amounts of vapor produced. We unscrewed the cartomizer and substituted another. Unfortunately there was no improvement. More puffing yielded the same disappointing results. We had seen and tasted enough for a single sitting and set the battery to charge and packed the remaining kit parts for the evening. The following afternoon we screwed a new cartomizer to our now-fully-charged battery and gave it a second opportunity to impress. The best thing we could say about the Gamucci Micro Deluxe is that it is consistent — consistently awful — but consistent nonetheless. Drawing was still more difficult than it should have been, the taste was still unappealing, and the vapor volume was still substandard. Disappointed, we set it aside and thought about all the people who continue to smoke Gamucci and reasoned that they either made their electronic cigarette buying decisions based solely on cost, or simply did not know better. During the fall of 2011, Gamucci redesigned their website, going from a white on black look to the current black and gray on white with turquoise accents. While the site appears to be professionally designed, the product line has been paired down substantially. It presently includes the two starter kits (detailed above); a single blister-packed disposable e-cig (also available in 12-packs); 4 accessory offerings (individual batteries, atomizers for their discontinued 3-part Classic Kits, USB chargers, and wall outlet adaptors); and cartomizer refills (available in individual 3-packs or bundles of 12 3-packs). That’s it. No more electronic cigars, no choice of e-cigarette models, no car adaptors, no carrying cases, no portable chargers. The cartomizer selection is available in Original (1.6%, 1.1%, 0.6%, 0% Nicotine) Menthol (1.6% Nicotine only), Grape (1.6% Nicotine only), Cola (1.6% Nicotine only), Coffee (1.6% Nicotine only), Vanilla (1.6% Nicotine only), Apple (1.6% Nicotine only), and Cherry (1.6% Nicotine only). It is rather odd that only the Original flavor is available in more than one Nicotine level. This is not good news for Gamucci customers. The site reminded us of the barren shelves found in stores that have stopped restocking inventory because they are going out of business. While we have no way of knowing if that is indeed the case, we can say that from a reviewer’s perspective, the future does not look very bright for Gamucci. Including the cost of the $49.95 Micro Deluxe Starter Kit, the cost to maintain the equivalent of a one-pack-per-day cigarette habit would be only $0.85 per day, or $5.94 per week, or $25.72 per month, or $308.64 per year. In terms of long-term costs, Gamucci proves difficult to beat — especially when compared to the cost of tobacco cigarettes which will set you back $2,555 per year for a one $7.00 pack per day habit. Gamucci has earned TWO AND ONE HALF STARS and it is NOT RECOMMENDED. There are just too many good e-cigarettes on the market to settle for Gamucci. Gamucci does not presently provide coupon codes. PLEASE NOTE: PRICES LISTED HEREIN ARE BEYOND THE CONTROL OF ECIGSHQ.COM’S EDITORS, AND ARE THEREFORE, SUBJECT TO CHANGE WITHOUT PRIOR NOTICE. COUPON CODES, DISCOUNTS, AND SPECIAL OFFERS CONTAINED HEREIN, ARE ALSO SUBJECT TO CHANGE OR WITHDRAWAL AT ANY TIME WITHOUT PRIOR NOTICE. PLEASE REFER TO THE RETAILER’S WEBSITE FOR UP-TO-DATE PRICING, DISCOUNTS, COUPON CODES, SPECIAL OFFERS, ETC. Don’t miss out! Click here to check out our current Special Offers.